We had a lovely Christmas Eve. At least in the afternoon, that is. Lots of friends, Christmas pageant at church, amazing food. The morning, however, was another story. It involved a very ugly scene with me yelling at the kids to pick up their stuff, escalating to me threatening to throw everything away, and raging that they shouldn’t be getting more stuff if they couldn’t take care of their things. Just the kind of peace, love, and joy you want for Christmas, right? I talked to a few other parents, and it sounds like I’m not the only one who had a similar moment. This, at least, makes me feel not alone, but the situation isn’t great. Particularly because it seemed to repeat itself several times in the next few days. I don’t ask the kids to clean up every day or even most days, but when we have guests or our cleaning help is coming, I expect them to pitch in. Usually, we put on a cleaning song and we all work together. But lately things just seem to be out of control. And I’m frustrated. This is admittedly a first world problem. A problem we are fortunate to have. 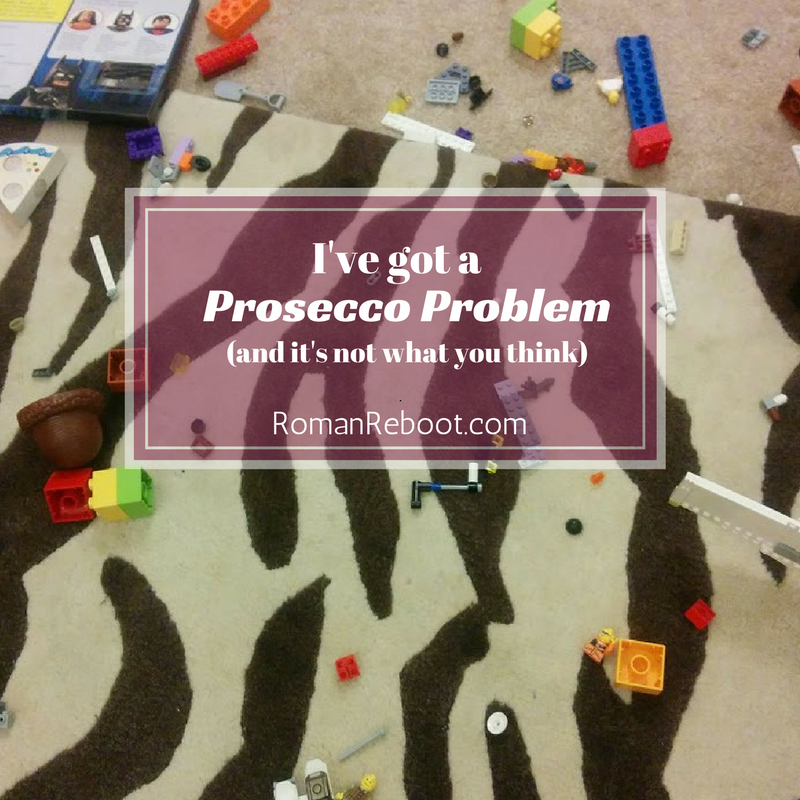 A recent book I read by a British author called this a “champagne problem.” Because we are in Italy, I’m dubbing this my Prosecco Problem. I’ve been trying to pinpoint my frustration. Is it that the kids won’t help clean? Is it that things look crazy? Is it that I don’t want to clean the stuff myself? I think I’m largely frustrated because if the toys aren’t picked up, I can’t rotate them unless I pick them up myself. If we’re not rotating toys, then I have a closet full of unused toys that should really go to someone who will use them. I try to cull, but I get overwhelmed. We are past the point of low hanging fruit of broken toys and mismatched sets. We need to let go of perfectly good toys. There is nothing wrong with them except for the fact that we have too many. I understand this, but then I get freaked out. What if they love these toys later? What if they just aren’t developmentally ready for them, but will love them in a few months? What if I NEED these toys on the next rainy day? On my last bout of rage cleaning, I stuffed lots of stuff in a garbage bag. Which is now in the closet. I choked when it came to actually passing things on or throwing them away. I watched the documentary Minimalism on Netflix the other day. The Minimalists are guys who have been on my radar, but I haven’t followed regularly. And then TheMomEdit linked to this article, How Getting Rid of ‘Stuff’ Saved My Motherhood. This was a helpful affirmation. Minimalism isn’t just about having less stuff. It is about having the right stuff for you. You should own things you love and use. Besides the stuff aspect, minimalism is about choice. You have a choice on what you want to put into your life and how to spend your time. Do I want to spend my time yelling at my kids about their toys? Absolutely not. I’m definitely going to go through the toys again. This time I will work harder to make some actual decisions. There is nothing wrong with this toy, but it would be better for someone else. Who knows if this will work, but I’m going to try having fewer sets out at a time. I think I get particularly stressed when multi-piece sets are everywhere. I tend to lose it when I’m stepping on tiny Legos, Duplos, train tracks, and Magformers all at once. Would it be better to try to get the kids to pick up more regularly? I don’t know. Usually cleaning up seems pretty arbitrary. I hate to waste that energy knowing that the toys will just come out again tomorrow. But would it help them build a habit? I’ve thought about this for bath time. They usually only bathe two or three times a week, and they FIGHT it. I’ve thought about doubling down on bath time. You are going to rage? FINE, baths EVERY DAY. It could help them get used to it? But this doesn’t sound very fun for the parents. I suspect this would be the same for toys. I don’t have the answers, but I know this cycle of rage has to end. It’s just not fun for anyone. What do you do for toys? Do you pickup daily? Have you threatened to throw all the toys away lately?